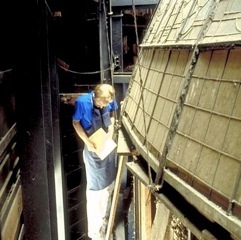 The restoration process begins with an analysis of a window’s condition. In many cases, these windows have deteriorated to an alarming degree, creating an eyesore and a liability for their owners. 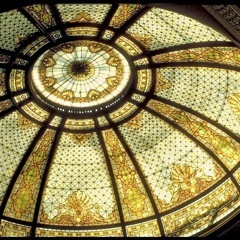 This Beaux Arts dome from San Francisco’s Hibernia Bank was originally built with no steel reinforcing. It nearly collapsed as a result. In response, we added an inconspicuous support system to save these huge but delicate panels. 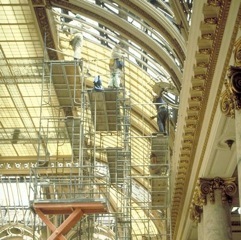 In the process we developed a unique seismic restraint system for leaded glass ceilings. This earned us an award for design excellence from the National Trust for Historic Preservation. Following a general analysis and condition report, the real work of restoration begins with 'documentation', and it continues throughout the restoration process. It is essential for both the Studio and the Client to have a baseline from which to gauge the accuracy of the ensuing preservation. It is equally important for future restorers to have an accurate and detailed account of what was done during our stewardship. 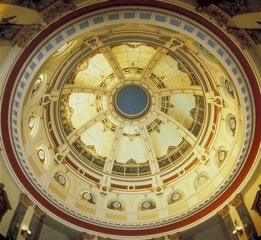 The final photograph of the San Mateo County Courthouse proves the value of meticulous effort and thorough documentation. 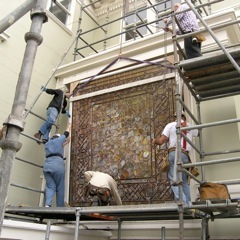 The removal of historic leaded glass is never a trivial process. Not only is access a challenge but the material being removed is typically in such fragile condition that it can often disintegrate as soon as you begin to handle it. 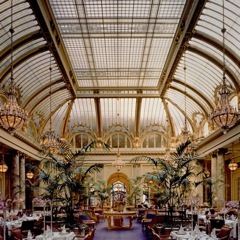 This was the case for these 17' long panels in the Garden Court, Sheraton Palace Hotel. 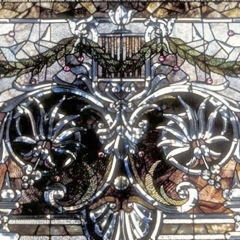 Evidence of how well the glass was removed and handled is apparent in the finished beauty of a restored masterwork. Just imagine what we can do from scratch if we can successfully dismantle, re-engineer, reassemble, and install a piece of this grandeur and complexity. Under even the most rigorous of conservation mandates, we are not always able to preserve all of the glass. 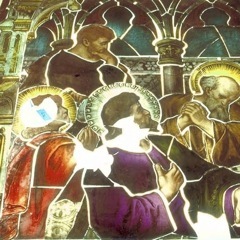 Sometimes it's just not there, as in the case of this and other vandalized windows from St Francis De Salles Cathedral. 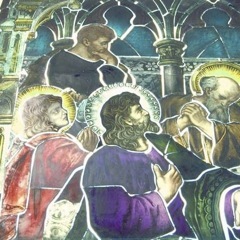 When we absolutely must replace original glass panes, we do so by imitating the original artist's hand. Great care goes into matching not just the pigments but the artist's brush strokes and even the bristles on the brushes used. 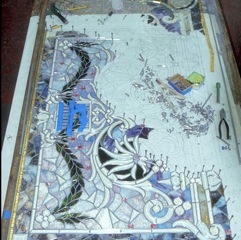 The assembly of fine leaded glass is akin to jewelry making. Each gem-like piece is set into a precisely cut and shaped length of lead came. The joints where the leads meet are soldered, and the gaps between glass and lead are grouted with putty. This putty provides both strength and weatherproofing. These ornate bejeweled and beveled windows come from one of San Francisco's finest Victorian mansions, the Henry Ohloff House. They are the more spectacular because of the delicacy of the leading. Installation is usually easier than removal, as the restored window is stable and structurally sound. 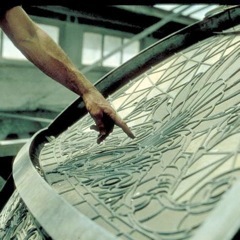 However, instead of installing one sheet of ordinary plate glass, we are often setting panels composed of a myriad of irreplaceable pieces, each one unique as a snowflake. 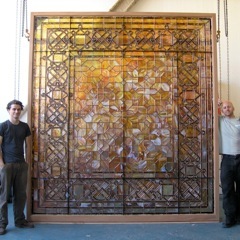 To our knowledge this is the very largest single undivided panel of leaded glass ever made. Each side is over ten feet long. Every step of the process provided a fresh challenge. The design and execution of scaffolding, rigging, handling, transportation, disassembly, fabrication, delivery, and installation all involved unique considerations.